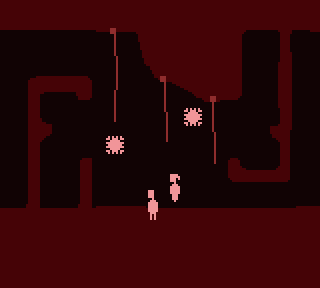 This short flash game is the first of Cavanagh’s library that either of us played. The game is based on the Greek myth in which Orpheus descends into the underworld to bring his wife back with him, on the condition that he doesn’t look at her while they are escaping. This condition that Orpheus receives in the myth is one of the things that makes this game unique, as for the entire second half of the game, you must preform typical platforming stunts (running, jumping, shooting) without turning around, or your wife will vanish and you’ll be sent back to the last checkpoint (which thankfully are frequent). This simple additional rule will cause you to think about basic platforming challenges in a totally different way and adds a refreshing twist to the more shooting heavy first half of the game (apparently Orpheus traded in his lyre for a pistol). It’s probably the best example of Cavanagh’s signature technique– imposing one or two limits and pushing the player against them in every way possible. All the colors you will see in the game. The art style is about as minimalistic as you can get but still manages to leave an impression. Don’t Look Back uses a total of three shades of red against a black background and still manages to create an immersive experience. 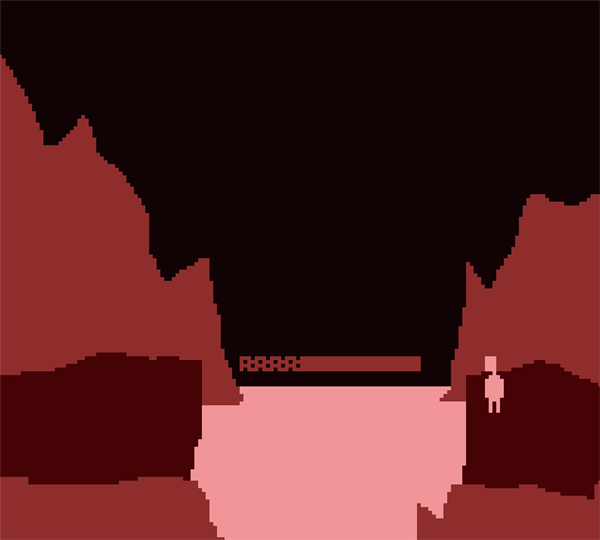 The blocky Atari 2600-style graphics (all in red) help emphasize how alien and disorienting a place the underworld would be, while also giving the game a washed-out and bleak feeling to match the protagonist’s grief. It also makes the game more memorable and recognizable, since with this color pallet, you’re not likely to confuse a screenshot of this game with any other out there. Many of the sound effects are also more realistic than you would expect (most 2D games for example don’t have realistic sounding footsteps) which, along with the somber music, help with immersion and set it apart from other games that use a retro art style. The game’s certainly not perfect. The difficulty ramps up fast and since the game respawns you without much warning, cheap deaths will occur. Also the ending, while hard-hitting back when the game first came out, might not seem as original these days. Still, Don’t Look Back is definitely worth playing and if nothing else, will be a memorable experience. The hardest challenge in the entire game, caused because you can’t step over a waist-high block. This is not only Terry Cavanagh’s most important and well polished game, but one of the best indie games ever made. VVVVVV is a metroidvania-style game where the player controls Captain Viridian, who’s on a mission to rescue his lost crew members from a strange dimension that they’ve landed in. Unlike other metroidvanias, you don’t look for weapons or gain new abilities to progress. In fact, other than moving right and left, you only have one maneuver in your arsenal the entire game: rather than jumping, you have the the ability to reverse your own gravity (or flip). This skill instantly allows you to do things you never thought possible in a platformer, like escape a deep pit by flipping up to the ceiling or crossing a gap by using the bottoms of moving platforms. 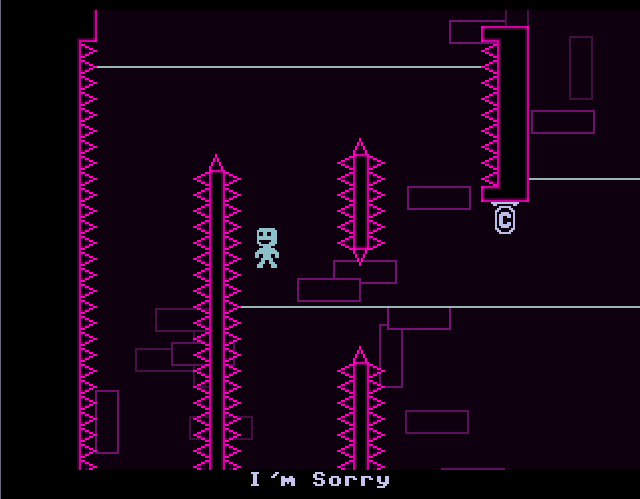 It also makes other platforming challenges much more difficult, like when you have to go up and then back down a deadly spike laden shaft to get over a tiny block in your way. Like only being able to travel in one direction in Don’t Look Back, flipping completely changes the way you experience a platformer and the game is structured around this unique ability brilliantly. You wouldn’t see these kind of manners from I Wanna Be the Guy. 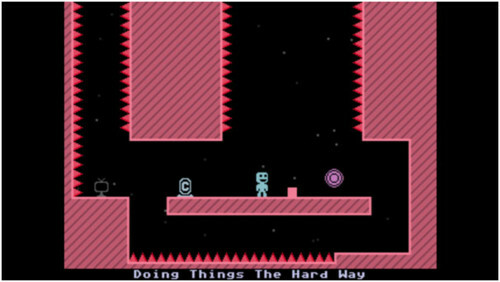 In VVVVVV, Cavanagh’s expanded his color pallet to six colors (eight if you count white and black), one for Viridian and each of his other five crew members. Each screen in the game has one background color (with numerous shades) and these colors change from screen to screen. In addition to creating a unique feel, this artistic choice shows what a jangled mess of a dimension that Viridian and his crew-mates are stranded in, creating a more cohesive and interesting world while still using very simple graphics. The soundtrack is also incredibly catchy, that kind of video game music that you’ll find yourself humming later. The the additional game modes (like Time Trial and the infamously hard No Death Mode) help add a lot of replay value making this easily the biggest of Cavanagh’s games (which makes sense since it is a commercial game). Overall, we can’t recommend this one highly enough. If you’re interested in indie games at all go pick it up now. It originally cost around $15 but you can easily find it for much cheaper now. The chaos of war, in 8-bit form. This game was actually a collaboration between Terry Cavanagh and Cactus (subject of last weeks entry) back in 2008, before the two games we just discussed. The minimalistic and brightly colored graphics certainly evoke the other projects of these designers. In Xoldiers, you control small squadron of troops who must destroy a specific target on each stage (always a purple temple like structure) while fighting their way through enemy tanks and soldiers. You move the squad as one object, meaning the more xoldiers you have alive the less maneuverable you are but the more firepower you have. Controlling the xoldiers as a squad helps evoke the sense of war surprisingly well. The xoldiers all shoot, duck, and move as one, and individually they’re helpless. No xoldier has any identity– it’s entirely about the squad. The massive explosions and giant plumes of blood (which can obstruct your tiny xoldiers from view) adds to the sense of chaos that the game presents and also makes destroying enemies more satisfying. The following mission is easier if you let some of your xoldiers die, because you have too many to fit in the door. And yet, instead of just reveling in its extravagant violence, the game has a harsh satiric edge. The incredibly over-the-top General who briefs the player before each level is hilarious but also is clearly intended to show the callousness and brutality of war. 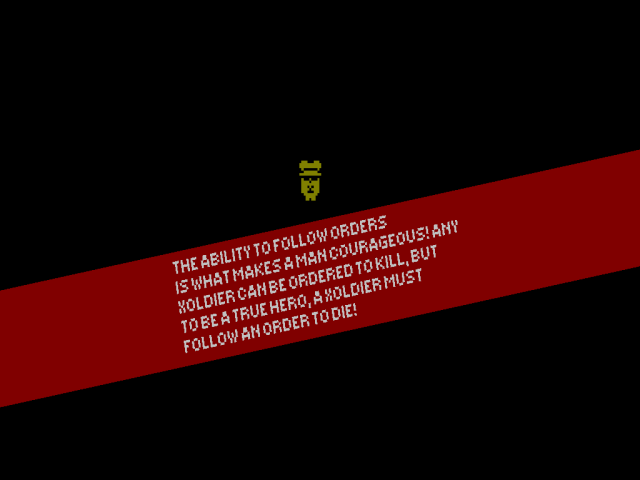 In one mission, the General declares that “A xoldier never retreats, and never looks back!”, and then you enter a mission where you start on the opposite side of the screen, only to find that your xoldiers can’t turn around to shoot. So you have to advance into enemy fire backwards all because a xoldier “never looks back!” In another mission, your xoldiers’ adherence to a solid block formation makes infiltrating a base nearly impossible. It’s not exactly subtle satire, but it fits for the style of the game. All in all, Xoldiers is definitely a fun little game to pick up and spend a half hour or so with, and manages to be one of the only anti-war games out there. Self Destruct: An entertaining vertically scrolling SHMUP where you try to survive as many waves of enemy fighters as possible. At A Distance: A two player puzzle game ideally played on two computers side by side. Radio Silence: A first-person game where you have to locate and collect several radios based on the sounds they release. Great atmosphere. Hexagon: Hard to describe this one. It’ll really test your reflexes. Very hard, but very addictive. The Metropolis Remix is here.